The Clouds Worksheet – Download our fun and FREE hidden words puzzle to print for kids. The free to print clouds worksheet includes a word searching puzzle along with a find the missing hidden words game for children. This science worksheet is completely free to download and print. Our hidden words game about clouds is a fun way to gain your kid’s interest and attention during early learning activities or homeschooling activities. This free words puzzle is appropriate for kids in Pre-K until 5th Grade. Young children interested in learning about science can have fun playing the word puzzle game and learning fun facts about clouds. Grade school kids from Grade 1 to 5 can enjoy the free to print clouds worksheet as a reading comprehension exercise. Children shall learn well about clouds, since they will most likely need to re-read several times the fun facts about clouds to find what the missing words are. This exercise will not only improve your kids skills to remember what they read but also enhance their reading comprehension skills. Preschoolers and kids in Kindergarten who cannot read can enjoy our free hidden words puzzle worksheet as an interesting listening comprehension tool. Parents or Educators can read out loud to the kids the fun facts about clouds and then ask the kids to remember what the missing words should be. Pre-K kids can also enjoy the hidden words puzzle while they learn to spot and recognize letters and words. Parents can use our free clouds worksheet to do fun homeschooling science activities with their kids while spending fun quality time teaching their kids about different types of clouds. Teachers can utilize the free to print clouds hidden words puzzle to gain kids attention and interest and to make learning about clouds enjoyable for kids. Tutors and Educators can use our clouds worksheet for special education programs and after school science activities. EasyScienceforKids.com is the best online kids science resource. We provide many fun educational free to print hidden words puzzles, word search games for kids and easy science worksheets. Use our word puzzles to make learning science fun for kids! There are different kinds of clouds. Some are big and black, others are thin and white. Clouds give us clues on what kind of weather is coming. Do you know how clouds are formed? What type of clouds are there? Why do clouds sometimes become pink or red when the sun sets? Learn fun facts about clouds by downloading our fun free clouds worksheet! [sociallocker]Download our free to print hidden words puzzle on clouds. Download our FREE Clouds Worksheet for Kids! Did you like the FREE Clouds worksheet? Read lengthy information about clouds here. Declan, Tobin. " 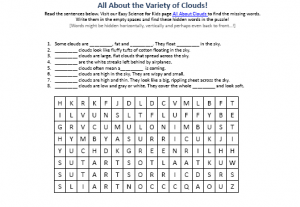 Clouds Worksheet - Free Hidden Words Puzzle to Print - ." Easy Science for Kids, Apr 2019. Web. 23 Apr 2019. < https://easyscienceforkids.com/clouds-worksheet-free-hidden-words-puzzle-to-print/ >.